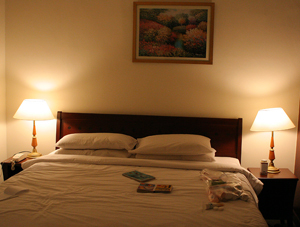 This is the king size bed at the side of the suite. 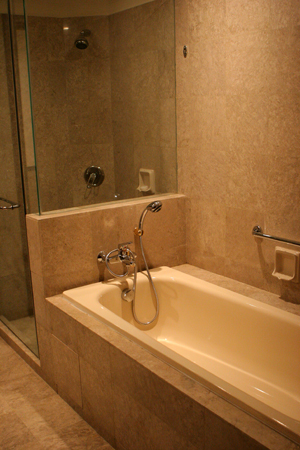 The long bath tub with shower. Only used it to bath Aiken. 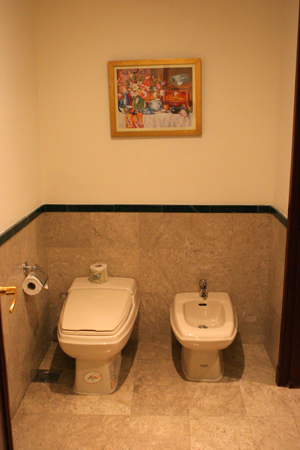 The toilet bowl and "washing facilities" is at the end of the bath tub through a door. Well, we were quite happy about the size of the suite. Only thing is that a lot of the "facilities" which are given/provided in other 5 star hotels are stuff like Iron, Hair Dryer, Room slippers and bathrobe. 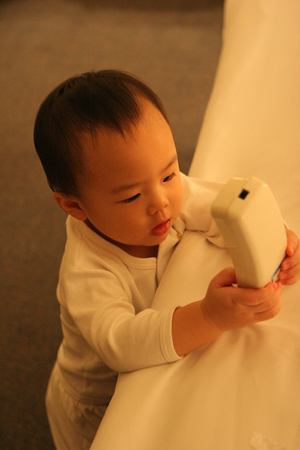 The hotel phone turned out to be Aiken's favourite toy for the next 4 days...haha. Another not so good thing about the hotel, to call for housekeeping, room service, etc, you must call Operator at 0 first. We went on to pack our stuff and need to coax Aiken to sleep.